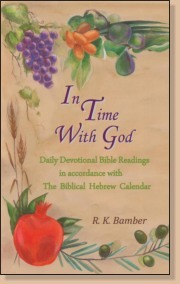 In Time With God provides the unique opportunity to purchase a daily devotional which follows the Biblical Hebrew Calendar, to discover today's date on the Biblical Calendar, and to download a free calendar and additional resources, which will enable you to connect with the Feasts and Seasons of the Bible, on the exact days that they occur. What is the Biblical Calendar? The Biblical Calendar is the Jewish Lunar Calendar used in the Bible. It follows the lunar cycle, where the new moon marks the first day of each month, and the Biblical Feasts of Passover, Weeks and Tabernacles, are connected to specific harvest times in the Land of Israel. The year begins with the month containing Passover and the beginning of the barley harvest. Why is the Biblical Calendar relevant to us today? The New Testament tells us that the Feasts of Scripture are 'shadows of things to come, but the substance is of Christ', Colossians 2:16. The Biblical Feasts (found in Leviticus 23, Numbers 28 and 29 and Deuteronomy 16) foreshadow our redemption through Yeshua, (that's the Hebrew word for Jesus), and Yeshua fulfilled the symbolism of the first four Feasts on the exact days they occurred. The final three Biblical Feasts have yet to be fulfilled in their entirety, since they foreshadow the Last Days and the second-coming of the Messiah. The Hebrew word, usually translated in English Bibles, 'Feasts', is the word 'Moed', and this actually means an 'Appointed Time'. The Biblical Calendar has 'Appointed Times', given by God. These reveal profound truth about God's plan of redemption and how it relates to our own lives. To complement In Time With God we now have a printed Hebrew-English Calendar available in handy A5 format. The calendar will help you relate the Hebrew dates used in the book to today's date. You can also download the latest calendar from our downloads section however you will find the A5 printed version more convenient to use. Look out for future products on this web page, which will help you to come in line with God's Appointed Times of Scripture and to apply the spiritual truth revealed, to your own life.